11424. Gary Joel GRIMES [scrapbook] 1, 2, 3, 4 (Helen May BITLER , John Peter , Franklin Heberling , John , Daniel , Daniel , Johannes ) was born on 7 Dec 1934 in Reading Hospital, West Reading, Berks Co, PA. He died on 30 May 1987 in Locrusty Memorial Hospital, Picayune, Pearl River Co, MS. He was buried on 4 Jun 1987 in Swamp Cemetery, Reinholds, Lancaster Co, PA.
Gary resided in 1935 in 410 S 4th St, Denver, Lancaster Co, PA. He resided in 1940 in 410 S 4th St, Denver, Lancaster Co, PA. He served in the military with U S Air Force in Korean Conflict. He resided in Chula Vista, San Diego Co, CA. He was issued a social security number in 1951/1952. Gary married Ramona F SCOTT [scrapbook] 1, 2, 3, daughter of Francis SCOTT and Dorothy SMITH. Ramona was born on 18 Oct 1935. She died on 27 May 1999 in Enon, Clark Co, OH. She was buried in Swamp Cemetery, Reinholds, Lancaster Co, PA.
Ramona resided in Chula Vista, San Diego Co, CA. She was issued a social security number in 1951/1952 in OH. She resided in May 1999 in Enon, Clark Co, OH. 16758 M i [Male] GRIMES. 16759 M ii [Male] GRIMES. 16760 M iii [Male] GRIMES. 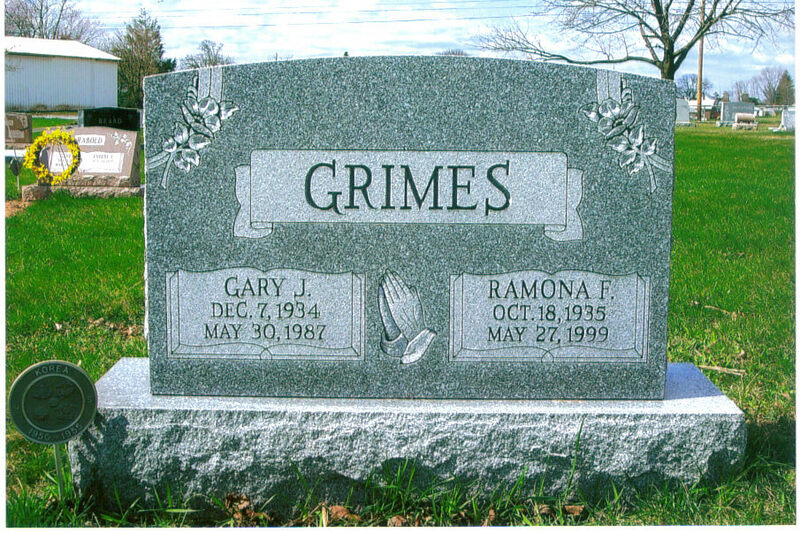 16761 M iv [Male] GRIMES. 11425. Steven Anthony BITLER (John Artz , John Peter , Franklin Heberling , John , Daniel , Daniel , Johannes ). Steven married Lynne D BAKER, daughter of Guy A BAKER Jr and Dorothy WAYLER. Lynne died before May 2014. Lynne served in the military with US Air Force - Major. She resides in May 1987 in Seoul, South Korea. + 16762 M i Brandon Anthony BITLER. 16763 M ii Benjamin Guy BITLER. 16764 M iii John Steven BITLER. John married Aimee Elizabeth STARK. 16765 F iv Stephanie Lynne BITLER. Steven also married Sandra SANDERS. 16766 F v Savannah Jane BITLER. 16767 M vi Jack William BITLER. 11427. Bennet Mellinger BITLER (John Artz , John Peter , Franklin Heberling , John , Daniel , Daniel , Johannes ). 16768 F i Laura Elizabeth BITLER. 11428. Jonathan Edward BITLER (John Artz , John Peter , Franklin Heberling , John , Daniel , Daniel , Johannes ). Jonathan married Margaret Jeanette PICKETTE. 16769 M i Adam Bradley PICKETT. 16770 M ii Aaron Phillip BITLER. 16771 F iii Bethany Janette BITLER. 11429. Henry Harrison BITLER Jr (Henry Harrison , Charles Franklin , Franklin Heberling , John , Daniel , Daniel , Johannes ). Henry married Rosalia MORRALES "Rosie" [scrapbook]. Rosie was born on 2 Oct 1943 in Puerto Rico. She died on 1 Jul 1980. She was buried in Terre Hill Cemetery, Terre Hill, Lancaster Co, PA.
Rosie was issued a social security number in 1961 in Puerto Rico. 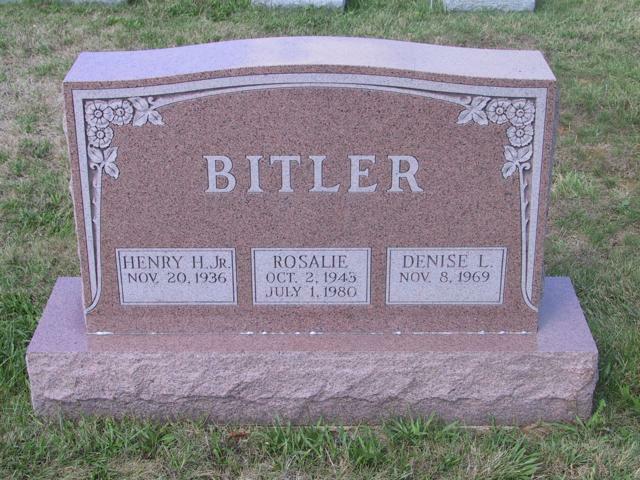 Denise Lynn BITLER [scrapbook] 1 was born on 8 Nov 1969 in Ephrata, Lancaster Co, PA. She died on 9 Mar 2003 in Mercy Suburban Hospital, Norristown, Montgomery Co, PA. She was buried in Mar 2003 in Terre Hill Cemetery, Terre Hill, Lancaster Co, PA.
Denise resided in Ephrata, Lancaster Co, PA. She was issued a social security number in 1975 in PA. She resided in 2003 in Willow Grove, Montgomery Co, PA. She resided in Mar 2003 in 604 DeKalb Pike, Norristown, Montgomery Co, PA. She was a member of Catholic. + 16773 F ii Lisa Michale BITLER. 11430. Henrietta Theda "Theda" BITLER (Henry Harrison , Charles Franklin , Franklin Heberling , John , Daniel , Daniel , Johannes ). Theda married Luis A GONZALES Sr [scrapbook], son of Felix R GONZALES and Fausta SANTIAGO. Luis was born on 29 Mar 1930 in Coamo, Puerto Rico. He died on 30 May 2008 in Lancaster General Hospital, Lancaster, Lancaster Co, PA. He was buried on 31 May 2008 in Bowmansville Mennonite Church, Bowmansville, Lancaster Co, PA.
Luis worked as Truck Driver with Ewell Trucking in East Earl from 1955 to 1977. He resides in Jun 2008 in 109 Boulder Rd, Mohnton, Berks Co, PA. He is a member of Forest Hills Mennonite Church. 16774 M i Luis R GONZALES. 16775 F ii Bontia Luz GONZALES. Bontia married Luis Benjamin ROSA. 16776 M iii Luis Antonio GONZALES Jr.
Luis married Karen Diane SENSENIG. + 16777 M iv Michael Antonio GONZALES. 16778 F v Brenda Lee GONZALES. Brenda married Gerald Lynn SENSENIG. 16779 F vi Juanita Maria GONZALES. Juanita married Jeffrey KREIDER "Jeff". 16780 F vii Teresa Maria GONZALES. Teresa married LaRue Alan BREASETTE. 16781 F viii Maria Luz GONZALES. 11431. Anna Mae BITLER (Henry Harrison , Charles Franklin , Franklin Heberling , John , Daniel , Daniel , Johannes ). Anna married Arnold P HABECKER "Arnie", son of Rufus HABECKER and Carrie Mae BUCH. Arnie was born on 18 Jun 1937 in Ephrata, Lancaster Co, PA. He died on 18 Feb 2008 in Essa Flory Hospice Center, Lancaster, Lancaster Co, PA. He was buried on 22 Feb 2008 in Terre Hill Cemetery, Terre Hill, Lancaster Co, PA.
Arnie was issued a social security number in 1953/1954 in PA. He resides in Red Run. He resides in 125 E Walnut St, Apt K, Ephrata, Lancaster Co, PA. He worked with Boose Aluminum Foundry. He worked with Ephrata Shoe Co. He is a member of Grace Brethren Church in New Holland, Lancaster Co, PA.
16782 M i Gary Lee HABECKER. Gary married Christine Lavera RICHELLE. 11432. Dorothy Lorain BITLER (Henry Harrison , Charles Franklin , Franklin Heberling , John , Daniel , Daniel , Johannes ). Dorothy married Wilmer Eugene MESSNER Sr.
16783 F i Jean Lorraine MESSNER. Jean married Douglas Eugene HOFFMAN. 16784 M ii Wilmer Eugene MESSNER Jr.
Wilmer married Michelle Louise ROSSER. Wilmer also married Ann Willette BROWN. 16785 F iii Annetta Jane MESSNER. Annetta married Raymond Earl RAVEGUM III. 11433. Jeannette Marlene "Jan" BITLER (Henry Harrison , Charles Franklin , Franklin Heberling , John , Daniel , Daniel , Johannes ). Jan married Donald Eugene RISSER. 16786 M i Lee Allen RISSER. Lee married Kelly Jo YOUNG. 16787 M ii Jason Lee RISSER. Jason married Kelly M MANBECK. 11436. Peter Edward MILLER (Anna Louise BITLER , Charles Franklin , Franklin Heberling , John , Daniel , Daniel , Johannes ). 16788 M i Steve MILLER. 16789 M ii Mike MILLER. 11437. Nancy Louise MILLER (Anna Louise BITLER , Charles Franklin , Franklin Heberling , John , Daniel , Daniel , Johannes ). Nancy married Rick M KRIEBEL. 16790 M i Rick KRIEBEL. 16791 M ii Cory KRIEBEL. 16792 M iii Benjamin KRIEBEL. 16793 M iv Casey KRIEBEL. 16794 F v Caitlin KRIEBEL. 11438. Theresa F BITLER (Edward Franklin , Charles Franklin , Franklin Heberling , John , Daniel , Daniel , Johannes ). Theresa married Vance David BOWMAN, son of William T BOWMAN and Thema Mae MOFFET. Vance was born on 27 Dec 1947 in Pottsville, Schuylkill Co, PA. He died on 21 Nov 2010 in Las Vegas, Clark Co, NV. He was buried in Southern Nevada Veterans Memorial Cemetery, Boulder City, Clark Co, NV. Vance resides in 1971 in 1106 N 9th St, Reading, Berks Co, PA. He worked as None in 1971. He resides in 2000 in 767 141st Street CT S, Tacoma, WA 98444-3398. + 16795 F i Jennifer Lynn BOWMAN. 16796 F ii Christine Elaine BOWMAN.